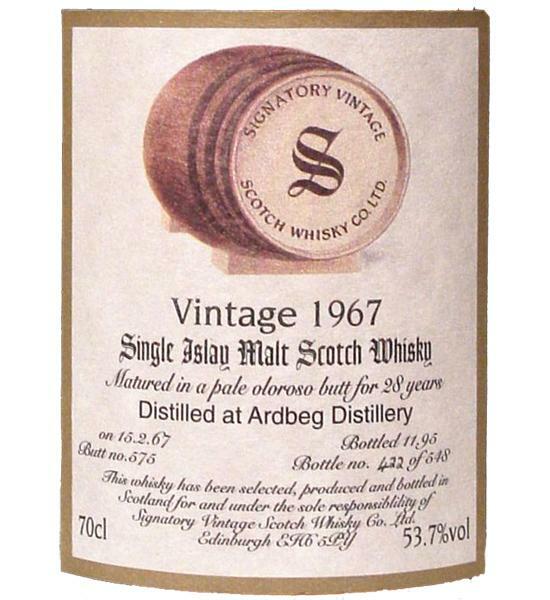 [April, 2000] I had another dram during an Ardbeg rarities tasting at Rolandsbogen. The price of this fine tasting was as low as 180 Deutschmark (90 Euros) plus 70 Deutschmark for an excellent four-course dinner. In my old rating system (ten scales that translate into WB points: 50 - 66 - 75 - 80 - 82,5 - 85 - 87,5 - 90 - 92,5 - 95) I scored this 95+ points. My notes state it has a more intense body than the dark oloroso edition but a less intense nose. and as a bonus dram "one for the road"
[October, 1999] I had this dram during a tasting at Rolandsbogen. 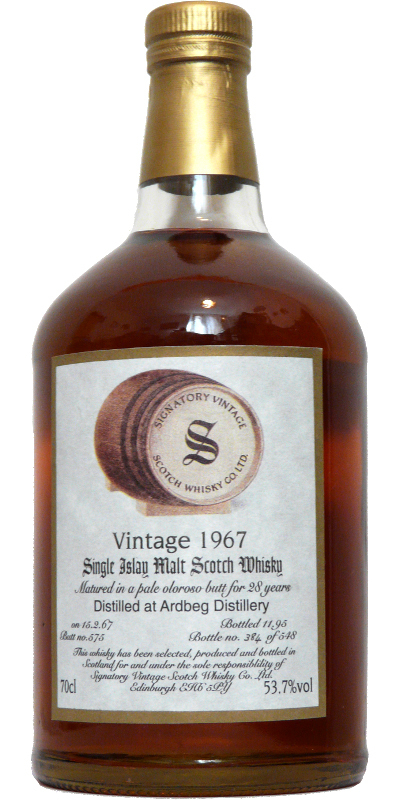 In my old rating system (ten scales that translate into WB points: 50 - 66 - 75 - 80 - 82,5 - 85 - 87,5 - 90 - 92,5 - 95) I scored this dram 95+. Unfortunately no additional notes were taken (except one word: "Wow!"). Nose: Complex old nose! Starts with glue, resin and gum, perfumed honey, herbs and almonds in rum. Slight salt and delicate maritime notes. Smoke and peat-free! Taste: Heavy and powerful. The aromas of the Oloroso barrel are now being highlighted. The sweeties get stronger, but also the sticky gum notes. In addition there are bitter orange and herbs, which are heavily salty; Accents of oak and lemon. Finish: Very long, salty and again gum. The waxy wood flavors become stronger; the syrupy sweetie remains until the end. Only now does smoke and some peat come to the fore and make the finish quite dry. Note: The slightly too strong rubber influence prevents a higher score for my taste! A profile so special! This is the first time I have tasted such a whisky. Still, it's excellent! Unique. I never smelled a nose like this. Extremely camphorated, resinous, with notes of universal glue, hydrocarbons and perhaps some rubber. Sawdust too, as well as herbal liqueur and verbena. Behind are softer fragrances, sweet almond oil and vanilla, as well as some marine hints. What a freshness! The particular profile of the nose is found in the mouth. Hard to describe, but there are notes of camphor, resin, eucalyptus, candy lemon balm, aromatic herbs. The texture is very fatty and the alcohol a little more present than in the Cadenhead despite a lower degree. This Ardbeg is medicinal indeed, but it looks more towards aromatherapy than to the classic syrup for cough. A little shorter than that of the Cadenhead, it is extended on pine resin, aromatic herbs and verbena. She dries her mouth slightly.